Precision Glass has two convenient locations in Fort Wayne, Indiana and Kalamazoo, Michigan. We offer quality and affordable windshield repair and windshield replacement with free mobile service to the Ft. Wayne and Kalamazoo surrounding communities. Precision Glass also offers residential & commercial glass services to handle any glass need for your home or business with free estimates. We are proud to be trained and certified by ESSEX in proper windshield installation and certified by AGRSS strict compliance standards for proper windshield repair and auto glass installation. 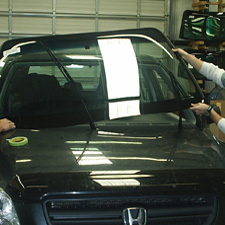 At Precision Glass, we take each windshield repair and/or windshield replacement we do very seriously. We understand how important proper auto glass installation is to you and your family’s safety. We only use highest quality OE and OEM replacement glass and related materials. Our choice for installation materials is second to none, and we use only urethanes approved by the manufacturer guidelines guaranteeing a safe drive away time (time the vehicle must set before it can be safely driven). You can’t go wrong by choosing Precision Glass. We are confident you will find our glass service to be the best in the industry and we back every windshield repair and auto glass installation with a 100% written lifetime warranty. Put your confidence in the leading local source for auto glass, residential glass, commercial glass and so much more. Trust Precision Glass.